Another great carry gun by Sig Sauer, the P238 with Rosewood Grips. 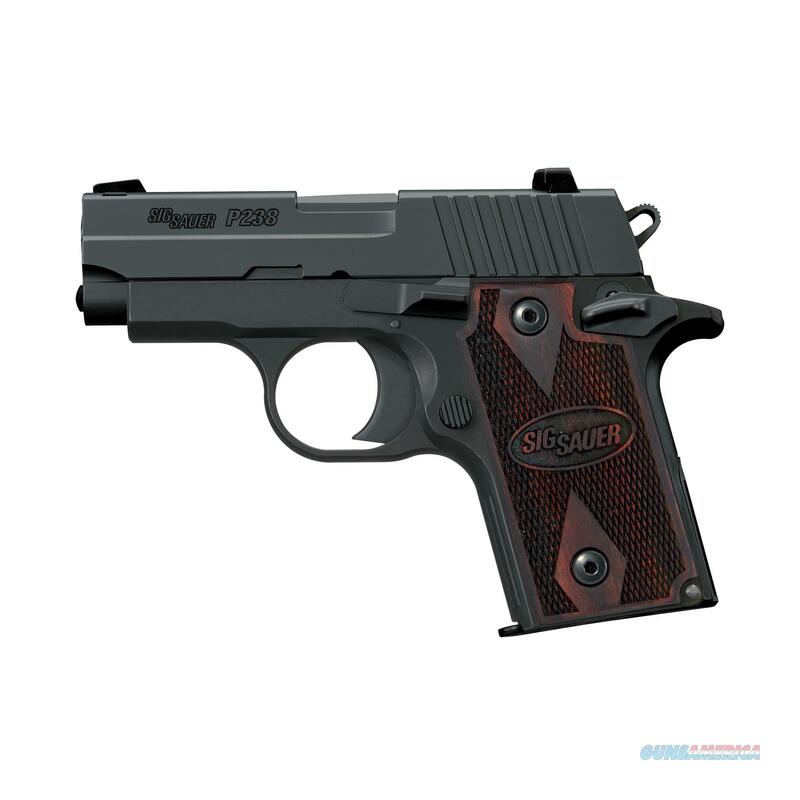 Sig Sauer, P238, Rosewood, Single Action Only, Compact, 380ACP, 2.7" Barrel, Alloy Frame, Black Finish, Rosewood Grips, Night Sights, 6Rd, 1 Magazine Product Specifications UPC Code: 798681417964 Manufacturer: Sig Sauer Manufacturer Part #: 238-380-RG Model: P238 Action: Semi-automatic Type: Single Action Only Size: Compact Caliber: 380 ACP Barrel Length: 2.7" Frame/Material: Alloy Finish/Color: Black Grips/Stock: Rosewood Capacity: 6Rd Accessories: 1 Mag Sights: Night Sights Subcategory: Pistols - Metal Frame Warning: California P65 says there is a possible danger to cancer and reproductive harm. Check out P65Warnings in CA. Before you bid make sure you can legally own a firearm and understand your state and local laws. Do not bid on this item if you cannot own it. Any return is subject to a 20% restocking fee. Payment and FFL are due within 7 days or we reserve the right to resell the item and will post you as a non-paying bidder. We accept Bank Certified Checks, USPS Money Orders, Visa and MasterCard. This listing is the Cash price. Please add 3% for credit card purchases. Shipping and handling fee is $40.00. Any questions you can call Don at Two Rock Technologies LLC or email Don. Please visit all our offerings on Guns America. We are a Service Disabled Veteran Owned Small Business (SDVOSB).